Forget everything I've written -- at least when it comes to the regions of France. Did we visit Cathar country in the Languedoc-Roussillon region? We did, and though the castles haven't uprooted and moved, they are now located in the region of Occitanie. This pays tribute to the historic origins of the area: the Pays d'Oc (from which came the word Languedoc -- or language of Oc, the name for the local dialect). Ten months ago, the area was two regions: Languedoc-Roussillon (already an amalgamation of two geographic areas) and the Midi-Pyrénées. Nine months ago, these two were merged into a "super-region" called Languedoc-Roussillon-Midi-Pyrénées. One week ago, they officially adopted their new name (that is, their new old-ish name): Occitanie. If it looks something like the store name L'Occitane that you see around the world selling soaps, lotions, and potions, it's not a coincidence. This is -- almost -- the region that bred the brand and still informs its ingredients and character. I say "almost" because while the original Pays d'Oc and language of Oc spread around much of southern France, some of that area is in the current province of Provence. Or what was the province of Provence. It too is part of a super region that's existed since 1998 (at least that's when they came out with their official super-region flag): Provences-Alpes-Côte d'Azur. And L'Occitane the store identifies itself with Provence; think fields of lavender, excellent for a soap-related business. To try to simplify a very complicated story: France tried to simplify their complicated regional structure (in a classically French bureaucratic way: by making it more complicated). Until the end of 2015, there were 22 regions in France. Of those, some have not changed in the Great and Confusing Regional Reform of 2016 (not the official name...), include several overseas French territories: French Guiana, Guadeloupe, Martinique, Mayotte, and Reunion. Corsica, just in the Mediterranean, remains Corsica. And there are some in the hexagon itself that remain unchanged: Ile-de-France, where Paris is located; Provence-Alpes-Côte d'Azur, Pays de la Loire;Bretagne; and Centre, which maintains its same borders, but changed its name to Centre-Val de Loire. As of January 1, 2016, the other half of the regions merged, forming the new super-regions of Bourgogne-Franche-Comte (combining 2 regions); Aquitaine-Limousin-Poitou-Charentes (combining 3 regions); Normandie (combining Upper and Lower Normandie); Alsace-Champagne-Ardenne-Lorraine (combining 3 regions), Languedoc-Roussillon-Midi-Pyrenees (combining 2 regions), Nord-Pas-de-Calais-Picardie (combining 2 regions), Auvergne-Rhone-Alpes (combining 2 regions). And as of the beginning of October, some of those have changed their names, such as with Occitanie. Thank goodness, because that was getting to be a mouthful. Aquitaine-Limousin-Poitou-Charentes becomes Nouvelle-Aquitaine. Alsace-Champagne-Ardenne-Lorraine is now the Grand East (the Great East). Nord-Pas-de-Calais-Picardie is now Hauts-de-France (the Top of France), which I find amusing because that places "Hauts" (the top) below "Bas" ("the bottom" -- as in Pays Bas, the French name for the Netherlands) on the map. There are now 12 mainland regions in the hexagon, Corsica, and 5 overseas territories, for a grand total of 18. Why, why did the Great and Confusing Regional Reform of 2016 even happen? Largely for budgetary reasons: fewer regions means fewer regional governments (phasing out roles and positions, gradually). Some of them were pretty seamless and uncontroversial, such as with Upper and Lower Normandy, who consider themselves culturally and historically one region anyway. Others were a little trickier, as evidently the people in Bourgogne and Franche-Comte were both so proud of their (rather glorious) heritages and histories that neither was willing to drop their name. 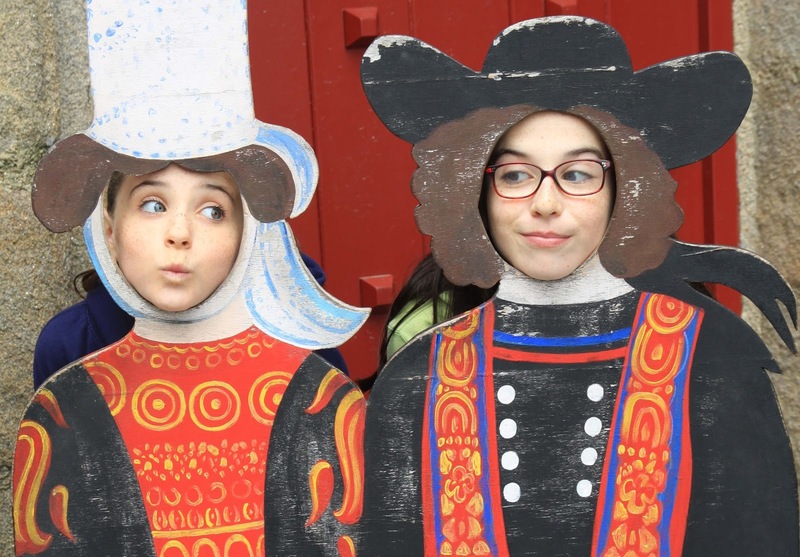 And everybody had the good sense to leave Bretagne alone, because there is no way on God's green Earth that they would have willingly merged with anybody. As far as the Bretons are concerned, France is lucky they even consider themselves a region of the country at all. 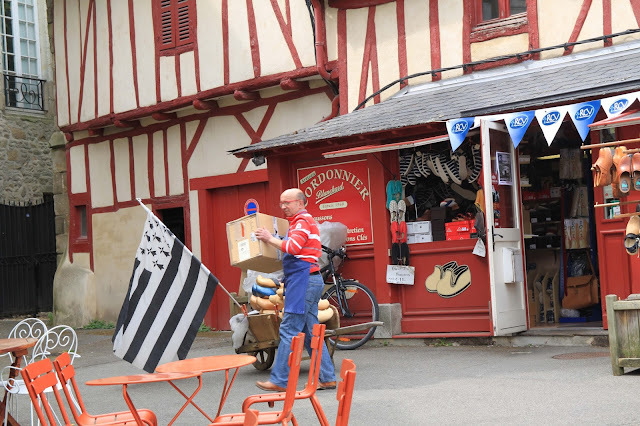 Here a typical scene in a cute Breton tourist town: no French tricolor but a huge Breton flag; Breton clogs; Breton striped fabric on the slippers, and a colorful timbered/colombage house. If France had tried, during the Great and Confusing Regional Reform of 2016 to merge Bretagne, I think Bretagne would have just given the country the side eye. Pavé Neuvillois, whose name roughly means "Cobblestone from Neuvillois", is a raw goats' milk cheese from the Nouvelle-Aquitaine region, specifically the portion that used to be the Poitou-Charentes, the area of France I consider to make the very best goat cheese. And this is one of its very best fromageries. So really, there is simply no way to go wrong. It's a gorgeous cheese, with a thick creamy heart and oozy wet outer lining, all held together by a crust I would describe as al dente -- just a little texture in the teeth. Pavé Neuvillois has hints of hazelnut, and grasses, and sunny fields (yes, sunny fields have a taste -- this is it). Salty, buttery, with the sweet cream of milk. It's an absolute joy, and my only complaint is that I only bought half of the brick, and that it's all gone. The name Neuvillois seems to have as its Latin roots the concept of "New City" (and also happens to sound like the related word "nouvelle" meaning "new") whereas this is a story about New Regions. Actually, it's a story about new names for regions that have been there, with different names, in previous incarnations. This particular cheese comes from the region that I called the home of the best goat cheese when I started this blog -- Poitou-Charentes. Just a few years later, but after the regional reform, Pavé Neuvillois is still made in the same place it always was, but now instead of hailing from Poitou-Charentes, it hails from the region of Nouvelle-Aquitaine. Nouvelle-Aquitaine is itself a new super region name, replacing Aquitaine-Limousin-Poitou-Charentes, which was too much of a mouthful. The cheese is also a mouthful, but in a good way. Here, in this photo, it is roughly the shape and orientation of Nouvelle-Aquitaine on a map. In case you're wondering, I have no intention of going back and re-identifying all the regions for the hundreds of cheeses I mentioned before the reform. They will simply stay that way on my blog, a reminder of simpler times, in an era not-so-long gone by, before France's Great and Confusing Regional Reform of 2016.